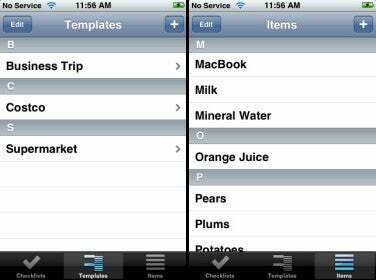 Back when the original iPhone was released, in June 2007, one of the most frequent complaints was that it didn’t include a program for keeping track of tasks and to-dos. We noted this omission ourselves in our article on features we’d like to see. We’re still waiting for iCal’s to-do lists to find their way onto the iPhone. But the good news is that with the release of the iPhone 2.0 software and the App Store, third-party vendors can (partially) fill that void. And a quick stroll through the list of productivity apps in the App Store shows you how many developers have stepped up to the plate: earlier this week I found 13 to-do-list programs; five more-advanced task managers designed around the Getting Things Done (GTD) system or aimed at complex project management; seven apps focused on keeping shopping lists; and a handful of apps, such as Jott ( ), that use voice recordings and other unique approaches to help you remember the myriad tasks you need to complete in your busy life. I decided to focus on the first group—basic list managers—as I suspect that most iPhone owners will be more than satisfied by a simple app for tracking lists of to dos. (We’ll be covering the other types of apps in future reviews.) Specifically, I looked at Chores, Dobot Todos, Lists, Lists (yes, two apps with the exact same name), My Lists, myTo-Dos with email, Tanjas Checklist, Tasks, and To Do. As I did with Sudoku, I choose a few of the better options to cover here. None of them offers all the features I’d like to see in a simple to-do-list app, but each has unique attributes that merit your atttention. 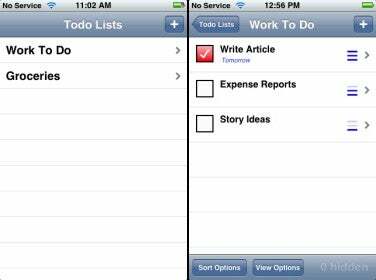 Before I get to my impressions, I should point out a couple major caveats that apply to most to-do and task-management programs available for the iPhone. First, none take advantage of Leopard’s Calendar Store technology, which means none sync directly with your to-do lists on your Mac—in iCal or in Mail. And although some we’ll be covering later do sync with online services, none of those services sync directly with OS X. In other words, there are currently no to-do-list apps that can sync with your existing to-do lists in iCal or Mail. TapeShow’s $5 Chores —which gets its name from the app’s term for tasks—provides an attractive interface for keeping multiple, simple to-do lists. The main screen displays the name of each list along with the total number of tasks and the number of completed tasks in each. You add new lists by tapping on the plus (+) button and then typing the name of the item; similarly, you add a new task to a list by taping the Add Chore button while viewing that list. Both completed and pending tasks are displayed; to get rid of a completed task you use the iPhone’s familiar swipe-delete action. 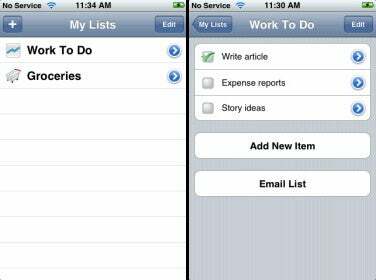 On the other hand, despite these useful conveniences, Chores lacks many features found in the other task-tracking apps covered here. For example, you can’t include notes with tasks, e-mail tasks or lists, or move a task from one list to another. 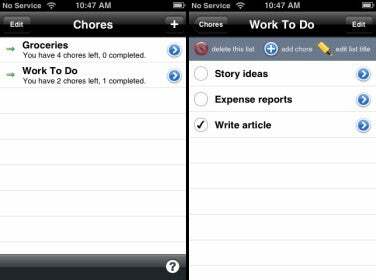 Chores also doesn’t support schedules or priorities (although you can manually reorder items within a list). And despite having fewer features, it’s more expensive than the three apps below. What kept Chores on my list, in addition to its attractive interface, is that the developer promises a Mac OS X version of Chores in August; according to TapeShow, the iPhone and OS X versions will synchronize your lists, filling a major hole in the iPhone’s to-do-list functionality (and likely earning Chores a higher rating). The best of the free to-do apps for iPhone, Aria Haghighi’s Dobot Todos features a plain-as-text interface, but one with a good number of useful features. Tap the plus (+) buttons to create a new list and to create new tasks within lists. You can assign a priority (Low, Medium, or High, represented by one, two, or three horizontal bars, as shown in the screenshot here) and a due date to each task, as well as include a note with details about the task. When viewing a list, you can sort by priority, due date, or creation date, and you can opt to view all tasks, just unfinished tasks, or just those tasks due today. You delete a task permanently by swiping. On the other hand, a few standard to-do-list features are missing. For example, you can’t rename a list once it’s created, nor can you move tasks between lists. You also can’t e-mail a task or a list. Finally, Dobot Todos’ features require quite a bit of tapping and typing to use. Paze Inc.’s $2 My Lists is the most visually appealing of the basic list apps I tested, and includes the clearest instructions (in the form of pre-configured lists of information that appear the first time you launch the program). Like the other apps, you create new lists using the standard plus (+) button, but I like that My Lists provides a larger, easy-to-tap button for adding items within lists. 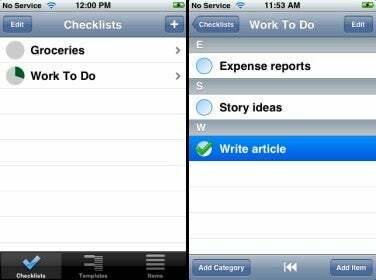 Both completed and pending tasks are displayed in lists, though you can delete entries permanently using swipe-delete or Edit mode. Each task you create can include a text note, and My Lists is the only app here that lets you email lists—including task notes—to yourself or other people. You can manually reorder lists and tasks within each list; however, you can’t move tasks between lists, and you can’t schedule tasks. A feature I really liked is the ability to add one of 18 color icons to a list by tapping on the list’s info arrow rather than on the list name. I found that when I had many lists, these icons made it easier to quickly find a particular one; for example, as you can see in the screenshot above, my Groceries list has a grocery-cart icon. Volker Funke’s $2 Tanjas Checklist —which, confusingly, appears as Checklists on the iPhone’s Home screen—has a few unique features that make it the best choice if you tend to re-use lists. The first is Items, a list of all tasks (or, for shopping, products) you’ve ever included in a list; the Items list comes pre-filled with a good number of sample items. The second is Templates, which are predefined lists of tasks/items; two templates, Business Trip and Supermarket, are included as starters, but you can edit these and create your own. When you create a new list, you can choose a template to use as a starting point; if you do, your list is automatically filled with the Items from that template. For example, whenever my family goes to Costco, we buy eggs, tortillas, bread, and several other staples; I created a Costco template that I use when making our shopping list. You can add items to, or remove them from, a template-started list as needed. Another unique feature is that Checklists lets you add sublists—called Categories—within lists; each main list can have an unlimited number of hierarchically nested categories. I also like that each list in the main screen shows, via a pie-chart icon, what proportion of the list’s tasks have been completed. Checklists doesn’t support schedules or task notes, nor can you e-mail tasks or lists or move tasks between lists. After testing these apps (and the others that didn't make the the cut—Lists, Lists, myTo-Dos with e-mail, Tasks, and To Do), I was disappointed to find that there wasn’t a single program that includes all the “essential” features of a basic to-do-list app without adding several additional layers of GTD or project-management complexity. Which means that if you’re looking for a simple task manager, you’ll have to decide for yourself which features are the most important. I found myself using My Lists for traditional to-do task tracking, and Tanjas Checklist for shopping lists, although if you want to be able to schedule tasks—or if you’re just looking for a free option—Dobot Todos is the way to go.